Ahhh Spring. Hello there! Lovely to see you! 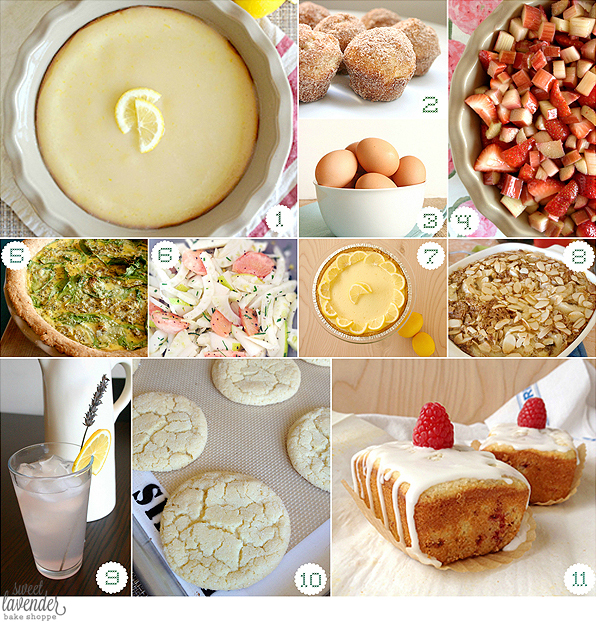 Thank you for bringing (somewhat) sunny days, a little warmth, and delicious spring-time recipes! Honey Lemon Blondies- no sugar added, just good 'ol honey. Easy Donut Muffins with Cinnamon Sugar- a perfect dessert to have at brunch! How to boil the perfect medium boiled egg- you know- for all those egg dyeing activities! Strawberry Rhubarb Crisp- tart, sweet, crunchy, buttery...MmMmMmmmmm! Ham + Spinach Quiche- a perfect way to use up all that left-over ham! Grapefruit + Fennel Salad with Pear- my husband and I love this salad! Sugar Free Lemon Cheesecake- I don't know why I associate Spring with lemons. But I do! Banana Almond Baked Oatmeal- another perfect brunch staple! Old Fashioned Sugar Cookies- chewy and slightly crispy around the edges, this cookie will please everyone! Almond Cardamom Poundcake with Raspberries- Two words: Yum. O.